by Tim Newburn and Jill Peay (eds). Oxford and Portland, OR: Hart Publishing, 2012. 322pp. Cloth $94. ISBN: 978-1-84946-300-3. Reviewed by Jean Sauvageau, PhD, Department of Criminology & Criminal Justice, St. Thomas University, Fredericton, New Brunswick, Canada. 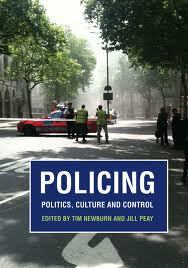 Policing: Politics, Culture and Control (hereafter PPCC) is an edited collection in honor of Professor Robert Reiner. The book celebrates his contributions to criminology on the occasion of his retirement from the London School of Economics. PPCC comprises 13 original contributions, the first one being an interesting biographical and career profile essay on Professor Reiner, by Tim Newburn and Paul Rock, which sets the stage for the following chapters. Each contribution thereafter carefully addresses one of the two main themes that marked Reiner’s intellectual undertakings. The list of authors is impressive. This is not a hagiography of Reiner; while respectful, each contribution endeavors to fundamentally challenge Reiner’s ideas and take them further. The chapters of PPCC are not grouped into thematic sections, although they could have been. One can certainly identify two major themes: public policing and criminal justice, for the most part in the context of England and Wales. Even though the policing theme is more prominent, with ten contributions, coverage of criminal justice in two chapters makes the title of the book slightly misleading. Let us first consider the contributions addressing criminal justice issues. Chapter 2, “Beyond Lamentation: Towards a Democratic Egalitarian Politics of Crime and Justice”, by Ian Loader and Richard Sparks, provides a thorough look at recent trends in the British justice system. The authors’ thesis is that, contrary to the opinion held by many scholars, criminal justice has not veered toward more punitiveness in recent years. There are plenty of examples where criminal justice has been deployed in more humanistic ways and where due process is prioritised over crime control. Furthermore, Loader and Sparks carefully lay out the basis of a theoretical framework for the promotion of more democratic and egalitarian politics of social order. In chapter 12, “Waiting for Ingleby: The Minimum Age of Criminal Responsibility – A Red Line Issue?”, David Downes and Rod Morgan explore the fundamental significance of the refusal – since it came up in the Ingleby Report on Children and Young Persons (1960) – to raise the minimum age of criminal responsibility (MACR) in England and Wales from 8 to 12 (the Conservative government compromised in 1963 and raised it to 10, where it remains to this day). Downes and Morgan show, based on international comparisons, that a low MACR is associated with relatively high incarceration and homicide rates. “Neo-liberal” countries such as the U.S., South Africa, England and Wales fared the worst with respect to the variables mentioned above, whereas “social [*125] democracies” such as Sweden, Denmark and Norway did the best. In light of this analysis, the authors join Reiner in calling for a social democratic criminology, which could help promote much-needed criminal justice provisions in England and Wales, including the raising of the MACR. Let us turn now to the contributions that address policing. In chapter 3, “‘Race’, Political Economy and the Coercive State”, Ben Bowling, Coretta Phillips and James Sheptycki, consider recent iterations of a race-based discourse, and their effects, with respect to border protection, policing and incarceration. The authors’ conclusions are unequivocal: border protection, policing and incarceration are an integral part of a system used for “the enforcement of global apartheid” (p. 63), based on the exploitation and segregation of ethnically designated “others.” Chapter 4, “Developments in Police Research: Views from Across the North Sea”, by Bob Hoogenboom and Maurice Punch, is the least formal contribution in the book, but that takes nothing away from its heuristic value. In part its value is that it constitutes an exposé of British and Dutch scholarly police research – a welcome departure from the more common single focus on American research. In “Cop Culture” (Chapter 5), PAJ Waddigton critically analyzes the concept of a police subculture usually presented – and as advocated by Reiner himself – as distinct and alienated from the mainstream civilian culture. Waddington demonstrates that police officers and the general public share many of the characteristics attributed to police culture, such as racial prejudice, lack of confidence in the criminal justice system and suspicion of others. What sets police officers aside, rather, is the legal capacity to act on their prejudice, lack of confidence and suspicions. Drawing on his own research and that of others, Waddington calls for a more subtle understanding of police subculture, which would improve the odds of achieving sound police reform. In chapter 6, “From Juliet to Jane: Women Police in TV Cop Shows, Reality, Rank and Careers”, Frances Heidensohn and Jennifer Brown take us into the world of television police fiction in Great Britain, comparing the portrayals of female police officers on TV to their actual working environments. To do this, Heidensohn and Brown discuss Reiner’s two opposing types of media portrayals: the media seeking to promote respect for the police versus putting forward a subversive image of the police. Heidensohn and Brown suggest a third function of the media in relation to the portrayal of women in leadership roles; namely, “prompting discussion about, presaging changes, and the settling of images of policewomen being in charge within the public” (p.117). Overall, the authors found that the depictions of women in police television drama in Britain have been relatively true to the reality of the occupation. Chapter 7, “Trial by Media: Riots, Looting, Gangs and Mediatised Police Chiefs” by Chris Greer and Eugene McLaughlin, and chapter 8, “‘The Anvil’ in the Information Age: Police, Politics and Media”, by Martin Inness and Roger Graef, address the same issues: the phone hacking scandal (said to involve both police officers and [*126] journalists, in which conversations of public personalities were targeted) and the riots that shook London in 2011. Greer and McLaughlin analyze these events in light of the police chief typology proposed by Reiner. That typology comprises four ideal types: the baron, the bobby, the boss and the bureaucrat. Based on the events under consideration, the authors introduce a new ideal type, the “mediatised police chief,” “subject to unprecedented 24/7 news media scrutiny, criticism and, if deemed necessary by an increasingly adversarial press, ‘trial by media’” (p.135). Greer and McLaughlin validate this additional type by demonstrating the capacity of the British news media to build and demolish the profile of a handful of the Metropolitan Police Service’s actual or potential police commissioners in just a few years.. Greer and McLaughlin conclude that the “mediatised police chief” is a necessary addition to Reiner’s original typology. In this light, British police chiefs should prepare themselves to handle the media adequately if they hope to stay in the job for any length of time. For their part, Inness and Graef examine the relationship between the media and the police as a whole in Great Britain. They point out that the media have changed tremendously in a short time with the advent of 24/7 news outlets coupled with a very active social media. These phenomena have increased the quantity of information as well as the speed with which it travels. This creates a serious problem for police services, which often rely on the availability of information to prioritize their work. The already problematic relationship between the police and the media, where the exchange of information is the primary currency, takes on a new complexity. One of the main observations made by the authors with respect to the London riots – that the police used 20th-century means and mindsets to handle 21st-century problems – applies equally well, in my opinion, to the whole range of police activities and collaborations. Inness and Graef conclude that police forces are conservative institutions that require crises to change. The Metropolitan Police Service experienced a number of crises in 2011; it remains to be seen if and how it will change. Peter K. Manning, with “Drama, the Police and the Sacred” (chapter 9), offers what is probably the most esoteric contribution in PPCC. Manning explores what he calls the “police as a dramaturgical actor with quasi-sacred features” (p. 176). Policing is theatrical drama, he argues, because police work is mostly about the maintenance of “the illusion of order” (fiction) (p. 178), made visible by the use of distinctive uniforms (costumes) and constant presence in public spaces (performances). The sacred (religion-like) features of the police include the permission to act secretly, the lack of strategic and tactical accountability, and the capacity to define (and justify in their own terms if need be) appropriate levels of force. It is only when these dramaturgical and sacred elements of the police institution are taken into account that its adequate theorizing will take place. For their part, Michael Levi and Mike Maguire, with “Something Old, Something New; Something Not Entirely Blue: Uneven and Shifting Modes of Crime Control,” (chapter 10) provide an interesting overview of some of the ways the police in Great Britain have tried to improve recently by, [*127] among others, becoming better organized and more proactive. They look especially at the promises of intelligence-led policing (ILP) and law enforcement with respect to financial crimes and organized crime. It turns out that ILP did not become as popular as expected in the policing milieu and that financial and organized crimes never became the systematized targets they seemed destined to be just a dozen years ago. Levi and Maguire conclude that policing has changed very little despite the opportunities it was presented with in recent years. It remains primarily a reactive and improvising institution. Chapter 11, “Democracy and Police and Crime Commissioners”, by Trevor Jones, Tim Newburn and David J. Smith, discusses the never-ending problem of police reform. Jones, Newburn and Smith examine the British Conservative Party’s proposal to replace the police chiefs in England and Wales with elected Police and Crime Commissioners in light of Reiner’s three main policing themes: the necessity of public policing, the function of the police in democratic societies and the democratic accountability of police governance. The authors have mixed feelings about the potential of this reform. On the one hand, it does offer the possibility of more democratic input into law enforcement. On the other hand, history has shown that the population, particularly at the local level, does not necessarily jump at the chance of exercising its democratic right to vote. An even greater concern is that a culture of electoral mandate one-upmanship, U.S.-style, could develop in Britain to address issues of crime and policing. In “The Shifting Boundaries of Policing: Globalisation and its Possibilities” (Chapter 13), Philip C. Stenning and Clifford D. Shearing attempt to predict the future of policing. Along with the traditional concern of civil unrest and the more recent one of international terrorism (as a result of the events of 9/11), the authors predict that 21st-century policing will be preoccupied with the “expected massive effects of global environmental change” (p. 280); these conditions will bring with them “new insecurities” in the form of serious diseases and frequent natural disasters. Insecurities (real or imagined) almost invariably translate into rules and regulations purported to increase one’s safety, which in turn involves law enforcement. As contributions to the scholarship of public police theory, the insightful chapters of this volume, inspired by Reiner’s work, are refreshing – and a quiet encouragement to police scholars to get busy. PPCC is a testament to the fact that police theorizing is difficult and still in its infancy. It is frequently said of edited collections that the contributions are uneven in quality. It is not the case here. While widely different from each other, every chapter offers interesting insights into public policing or criminal justice. The authors all prove to be attentive students of Reiner’s thinking. They are well past the superficial notion of the police as a more or less efficient crime-fighting institution. Instead one is exposed to critically challenging attempts at making sense of the police on a second, if not third (I am thinking here in particular of Chapter 9), level of abstraction and symbolic significance. And for all the critical treatment the police and the criminal justice system are subjected to in PPCC, the authors never fall into the trap of more [*128] simplistic, conspiratorial, or radical assumptions. One caveat: The majority of the contributions that deal with policing – with brief exceptions in Chapters 3 and 13 – are limited to the obvious topic of public policing. Reiner himself has come around in the latest edition of his classic The Politics of the Police (2010, pp. 5-6; as explained in Chapter 13), and now includes in his definition the idea that policing is performed by a vast array of agencies, individuals and technologies beyond the public police. It is due time for police scholars to pay closer attention to all the elusive as well as the obvious forms of policing. Among the welcome practical features of PPCC is having references located at the end of each chapter as opposed to having them grouped together at the end of the book; the extensive author and subject index makes the book even more useful. Policing: Politics, Culture, and Crime Control deserves to become a solid reference on policing and criminal justice as they were in the opening decade of the 21st century. It will be of interest to policing scholars, and, as a pedagogical tool, appropriate for graduate courses in criminology, sociology and political science. Reiner, Robert. 2010. The Politics of the Police, 4th ed. Oxford: Oxford University Press. Copyright 2013 by the Author, Jean Savageau.